On October 18, 1929, the Judicial Committee of the Privy Council of Great Britain handed down the decision that women were “persons” under the law. Today it is easy to forget that this was not always considered to be the case and that women have had to fight for rights that men took for granted over many centuries. Certainly, I never learned this piece of history in school and it is not clear that this is even taught in a routine fashion today despite the ongoing need to involve women in politics. To me, this means that we have to get young women interested in public life early. I doubt that few in Canada even remember the names of the Famous Five, the five women from Alberta responsible for challenging women’s legal standing in Canada. 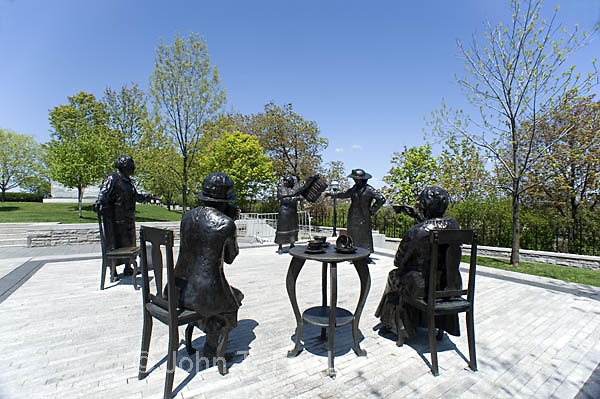 The women were Emily Murphy, Nellie McClung, Irene Parlby, Louise McKinney and Henrietta Muir Edwards. The women took their case to the Supreme Court of Canada who concluded that women were “persons” under Section 24 of the British North America Act. At the time the Judicial Committee of the Privy Council was a higher court than Canada’s Supreme Court, hence the women took their question forward. I have always been puzzled by women’s equality. I spent Grade 1 in a Catholic School and could not understand why the nuns who were my teachers were so shocked that I aspired to be a priest at the time. No one ever gave me a good reason that women could not be priests, and certainly women in the Catholic Church still wonder about the theology, I am sure. After my father died, despite having paid the mortgage for a year, my mother lost our family home since women were not allowed to have mortgages in Quebec in 1968. In the 1970’s when I was in medical school, few people ever immediately took the female clinical clerks to be the medical students they were. I still have the green skirt that was the bottom portion of the green Operating Room uniform I was required to wear as a female medical student. Many of my male professors still addressed classes using “Gentlemen”, even in the late 70’s. In 2004, as the Chair of the Ontario Medical Association’s Women’s Issues Committee, I negotiated with a government representative the first maternity leave benefit for women physicians. It was inadequate then and it continues to be inadequate now and I remember feeling disappointed that it was such a footnote on such a large contract. Women physicians and their supporters, however, felt it was an opening that would become more significant over the years. Women, however, still have to fight for their due in medicine. Politics in medical associations, university faculties, and even practice groups are still not engaging women to the same degree as they engage men. The research uncovers some reasons, but even as society seeks to address these, equality continues to elude us all. I believe that one reason lies in the fact that the quest has been one-sided. Society paid particular attention at the turn of the century when the lack of women in medicine began to be addressed with the result that at least half of most medical classes are now women. The low numbers of women in Engineering and on Corporate Boards continues to be addressed in one way or another. But does anyone worry about the number of men in Teaching, or in Nursing, or in Library Science? It happens that my husband is a Librarian. He was one of few men in his M.L.S. Program forty years ago. My son is now studying for his Masters in Information Studies. He will be a Librarian – he is one of very few men in his class. Maybe we need not just to focus on where there are few women. Maybe we also need to also change certain workplaces for men in order to change an entire culture.